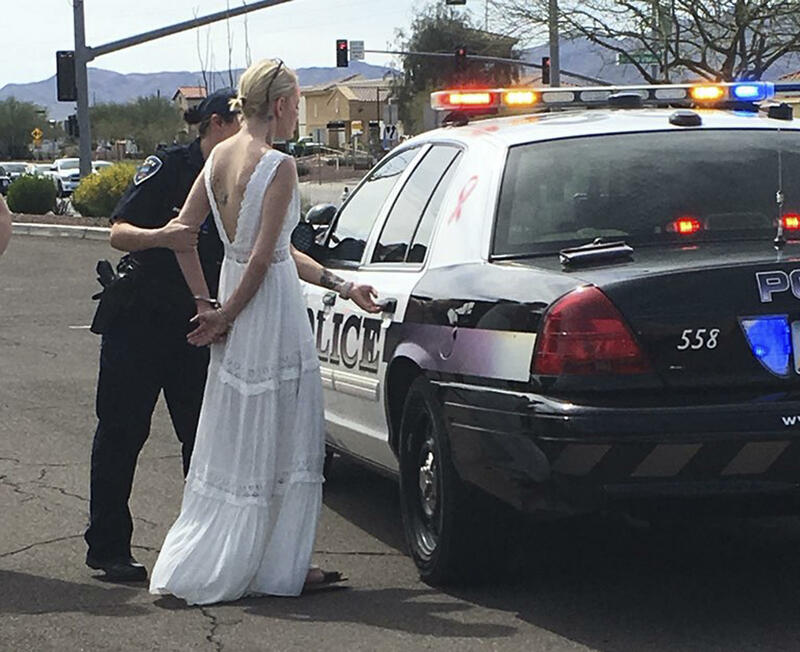 MARANA, Ariz. -- Police say a bride in southern Arizona was arrested on suspicion of impaired driving after she was involved in a car crash on the way to her wedding. Amber Young was wearing an open-back dress when she was handcuffed and put into a police cruiser Monday in Marana, 30 miles north of Tucson. Police spokesman Sgt. Chriswell Scott says one person suffered minor injuries in the crash. It is not known whether Young has an attorney who can comment on her behalf. Scott tweeted, "Don't drive impaired, till death do we part doesn't need any help." Young was taken to a police substation to have her blood drawn and released without going to jail. It's unknown whether Young made it to her wedding. Arizona has some of the strictest DUI laws in the country, CBS affiliate KPHO reports. Driving with a blood alcohol level of 0.08 percent or above is illegal, but Arizona law allows consequences if there is impairment "to the slightest degree."